See unit(s) available for full description. From the spacious outdoor living area, gaze out towards Kapalua Beach and turquoise color sea coves. 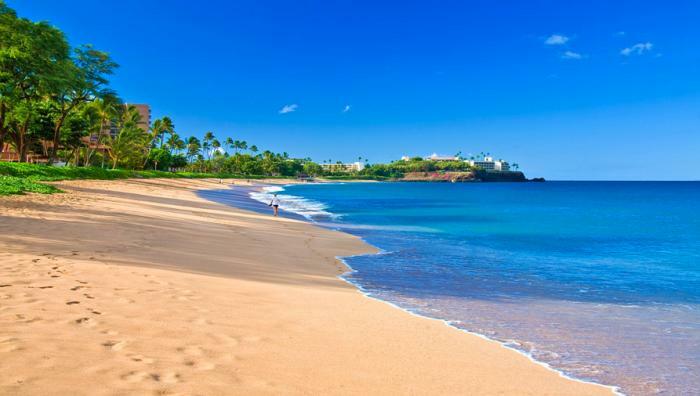 Kapalua Beach, a sandy beach where calm clear waters wash gently against golden sands, is one of the world`s most favored beaches. Guests of the resort now enjoy complimentary beach services including towels, water, and beach chairs on Kapalua Beach. Guests may also rent other assorted ocean sports equipment at the beach. Guests of this villa are provided with beach towels, cooler, and portable beach umbrellas that are specifically owned by your villa. They are for use when visiting other beaches along our sunny and sandy shores. Please be sure to leave them at your villa after use. Sea Mist Villa 2403 is situated on the fourth floor (five floors total) in the oceanfront row of the whole ownership private apartments. From 2403 you have an unobstructed panoramic direct view of the sparkling sapphire-blue Pacific Ocean. You can also see all of the swimming pool area with its cascading waterfalls, grottos, and lushly planted garden islands. Sea Mist Villa 2403 was meticulously designed and elegantly appointed with your comfort and convenience in mind. There are three and a half bedrooms (two California King beds in two master suites, two queen beds in the third bedroom, a third queen bed in the den alcove off the kitchen), three and a half bathrooms, a fabulously well-equipped kitchen, private enclosable ocean front dining room, in-villa Bosch laundry room, HD subscription on five HD oversized flat panel televisions, iPod docks, HD DVD/CD players in all bedrooms and even a television in the master bath adjacent to the deep soaking tub!